As a participant in the NECC/Lawrence HS Early College Program, Marielis Almanzar earned six credits while in high school. She is now a sophomore at Northern Essex. She is shown with her parents Jose and Edilburga Almanzar and her nephew Dyland Alvarez. Northern Essex’s Early College partnership with the Lawrence Public Schools is one of only nine programs across the state to receive the official seal of approval at the state level. The partnership was recently granted official designation status by the Baker-Polito administration after a rigorous one-year selection process. As a result, the college has received a $140,000 implementation grant. Early College programs combine traditional high school classes with college courses through a local public college or university to give high school students knowledge and exposure to an area of study, while earning up to 12 college credits – equivalent to one semester ­- for free. Programs were selected for official designation based on five principles: equitable access for all students, guided academic pathways, enhanced student supports, relevant connection to career, and deep partnerships between high schools, community colleges, and state universities. In addition to Northern Essex, Merrimack College’s partnership with Lawrence Public Schools was selected as an officially designated program. 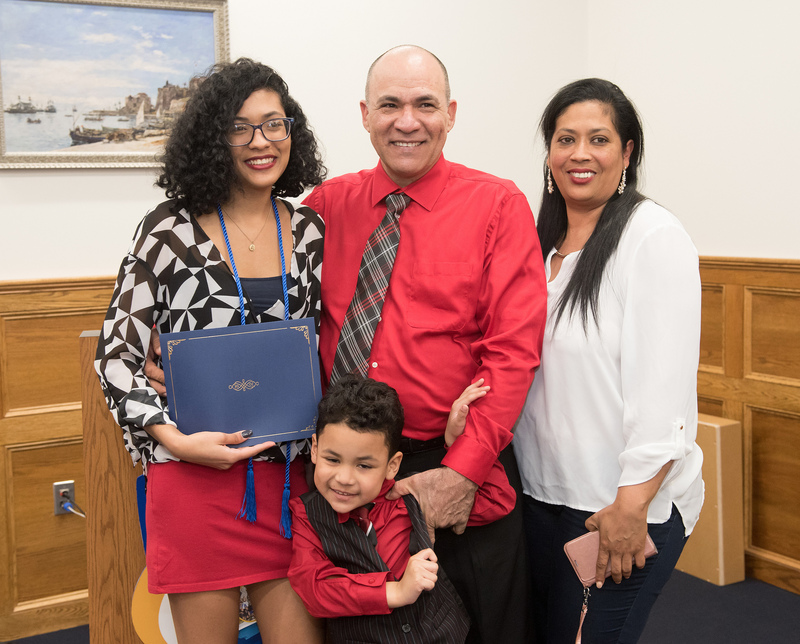 Marielis Almanzar, a 2017 graduate of Lawrence High School, was part of the first group of students to graduate with Early College credits. She graduated from high school with six college credits, and is currently enrolled in the Liberal Arts Program: Psychology option at Northern Essex with plans to transfer to UMass Boston or UMass Amherst after earning her associate degree. Almanzar came to Lawrence from the Dominican Republic as a teenager, speaking no English. She spent two years in the International Academy at Lawrence High School and then transferred to the Math, Science, and Technology Academy. “Taking college courses in high school, better prepared me to succeed in college,” she says. “This program has helped me understand responsibilities and how to be a college student. Northern Essex currently has Early College Programs with Lawrence, Haverhill, Whittier and Amesbury high schools. This semester there were 300 high school students receiving college credit from Northern Essex by enrolling in Early College Programs or other high school partnerships. “We expect to have 300 students in the spring and an additional 30 students in the summer session,” said Noemi Custodia-Lora, who as vice president of Lawrence Campus & community relations oversees K-12 programs for the college. For more information, contact NECC’s PK-12, pk12@necc.mass.edu or 978 659-1235 or visit the website.